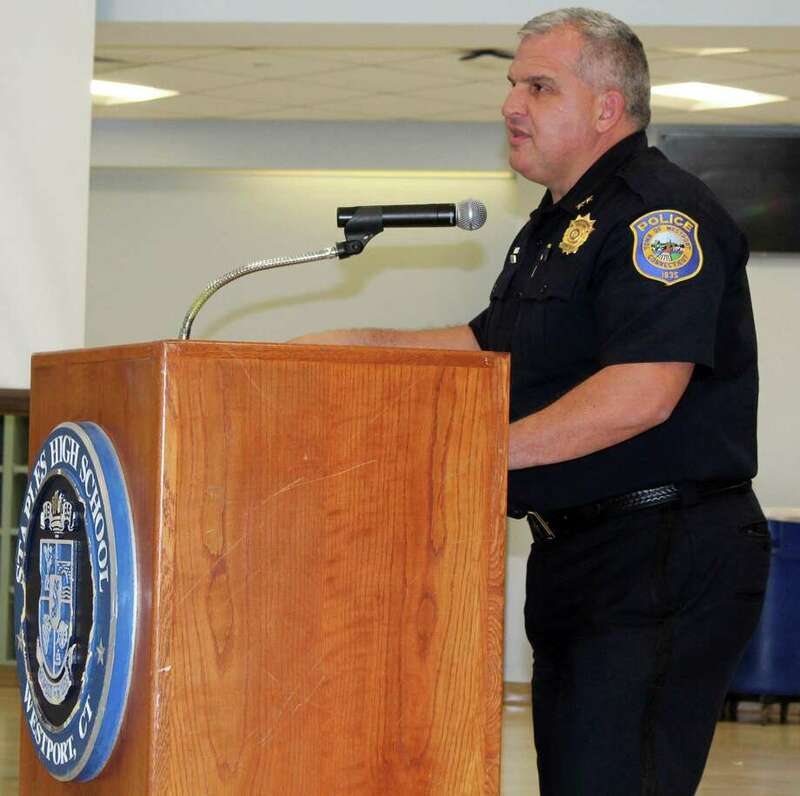 Westport Police Chief Foti Koskinas spoke at the Aug. 27 Board of Education meeting at Staples High School in support of funding for two additional school resource officers (SRO's) at Westport schools. WESTPORT — Third time’s the charm, at least the school board hopes so as it makes it’s third appeal to town’s finance board to fund two additional police officers for Westport schools. “I will not retreat from my request to the board for this year,” Superintendent Colleen Palmer told the Board of Education (BOE) in her call for the board to once again push forward a funding method for two additional police officers to be stationed at Westport school’s this school year. Palmer first recommended the BOE institute more school resource officers (SROs) in Westport schools last Fall. After much discussion and a series of school shooting events across the country the school board signed on to the plan. The Board of Finance approved the school board’s request to reappropriate money from the D.A.R.E. officer program to fund an SRO at Staples High School, but has twice over the last two months rejected proposals to fund two additional officers to be housed at Westport’s middle schools. Each time the BOE decreased the requested funding amount for the SRO’s — from a request of $320,000 to the Board of Finance (BOF) at its July 11 meeting to a $2,600 request to the BOF on Aug. 11. Now, the BOE is hoping the BOF will approve an even lower funding request of $185,000. The significantly lower request is possible because the BOE is no longer asking for the BOF to fund two new officers to fill the positions but rather pay two current Westport police officers to fill the position solely in an appropriation of funds for overtime pay to the police department. In a 6-1 vote to once again bring the request to the finance board, Vik Muktavaram was the only member to vote against the resolution. “If rational people, if reasonable people are asking questions and asking for a pause, I think we should respect that,” Muktavaram said in reference to the BOF’s decision to twice vote down funds for the additional SRO’s. The BOF, which meets Wednesday, has not yet slated a time to vote on the new SRO funding request.